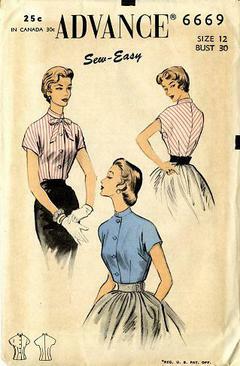 1954 Advance #6669 vintage sewing pattern, misses' blouse with tiny stand-up collar, size 12. 'Sew Easy' blouse is made from only one major pattern piece plus two minor pieces - body of blouse is cut and dart fitted to hug the waist. High round neckline with tiny stand-up collar with or without bow. Button front closing. Unprinted tissue pattern, unused factory folded.